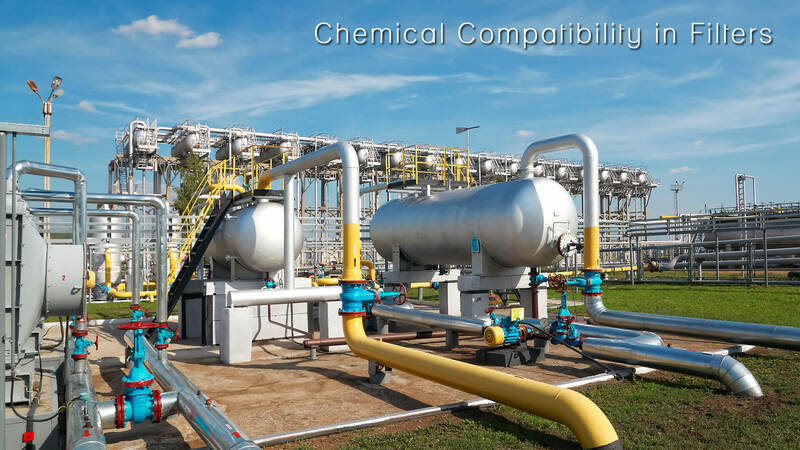 The term Chemical Compatibility refers to the harmonious corelation between two substances while coming in contact with each other. It is measured by considering the stability of a substance when mixed with the other. While mixing, if the elements do not show any change then they are held as compatible, whereas if the matters undergo any physical or chemical change (especially if the change is adversely affecting the desired outcome)they are considered to be chemically incompatible. Chemical compatibility is a very significant factor in the process of filtration. While filtering liquid, gas, or air, the components of the filter material needs to be taken into consideration. The material of filter should be compatible with the chemical nature of the liquid being filtered. This minimizes the risk of failure during the process. Often chemical compatibility is viewed in relation to liquids, but many a time, the dissolved solutes may intermingle undesirably with the filtrate media. Therefore, it should be ensured that the filter media is sensitive or resistant to any particular substance. It should be taken care that no impairment is caused to the mediadue to the chemical exposures. Only if they are found compatible, one can go ahead with the filtration process. Compatibility is affected by various factors like length of exposure time, concentration, temperature and applied pressure. These factors individually and in combination are capable of affecting the process of filtration. These factors become especially crucial in case of filtering the organic solvents. The media of the filter should be resistant to the solvents; otherwise it would be of no use in filtering those solvents. Also if the solvents chemically attack the filter or if the filter undergoes certain chemical degradation, it may release foul elements into the stream, thus leaving it useless for all practical purposes. Besides, some solvents are such that they won’t destroy the filter but could get absorbed into the polymer matrix, hence, altering the pore size and altering the performance of the filter for future use thereby reducing its life and efficiency in the long run. In the case of filtering the aqueous solutions, similar situation can occur. Hence, it should be noted that the filter does not face any damage due to the aqueous stream. Chemical additives, pH balance and acids and bases should be tested specifically to determine the effect of various factors on the filter media and to comprehend the sensitivity of the filter. While selecting, an appropriate filter can give you the desired results, but with so many options at our disposal how will you be sure that you are choosing the correct filter? 1. Pore size – The porosity of the filter media determines how finely it can filter the substance. Hence, finer the filtration you need, smaller should be the pore size that you should opt for. 2. The housing material – The container where the filtered particle will be placed is known as the housing material. The material used in building the housing materials and its physical and chemical properties are a major concern when it comes to selecting a filter. 3. The media area – The media area is another crucial factor to be considered. The Flow rate of the fluid is mainly determined by this factor. The quality and density of the media is equally important-otherwise the entire process gets redundant. 4. Design of the filter – The shape of the filter used is also one more crucial factor. It is closely related to the dynamics of fluid flow. It will affect not only the hydrodynamics but also indirectly affect the sedimentation process which in turn affects the longevity of the same. 5. Loading capacity – The capability of a filter to load particulates into the fibrous matrix while maintaining a practical filtration speed and a workable pressure across the filter is the loading capacity of the filter. Loading capacity of the filter is one of the most important factors from the economical point of view and should also bean important criterion to maximize benefits that can be extracted from the filter; without compromising on quality. 6. Particle retention – Last but not the least, is particle retention.Rather, on the contrary, this can probably be labelled as the single most important criteria that will determine the quality of a filter and something that even a layman will well be aware of. It is defined as the capability of the filter to retain the particulates. These are but some of the most important points that must be kept in your mind while choosing a filter. The quantitative values of the determining elements will definitely vary depending on your specific need and use. Besides, at times, certain trade-offs may be necessary considering the economic and technical issues affecting the interest of the producer and the consumer.